Hi Friends! It's been a while! I was bummed to have an unintentional blogging hiatus when I came down with a nasty cold/sinus infection combo that put me out of commission for an entire week. I'm slowly recovering and fighting off the nasty bug! I think sunshine and spring weather would be the perfect cure :) I've missed blogging, believe it or not! So I'm happy to get back into the swing today! 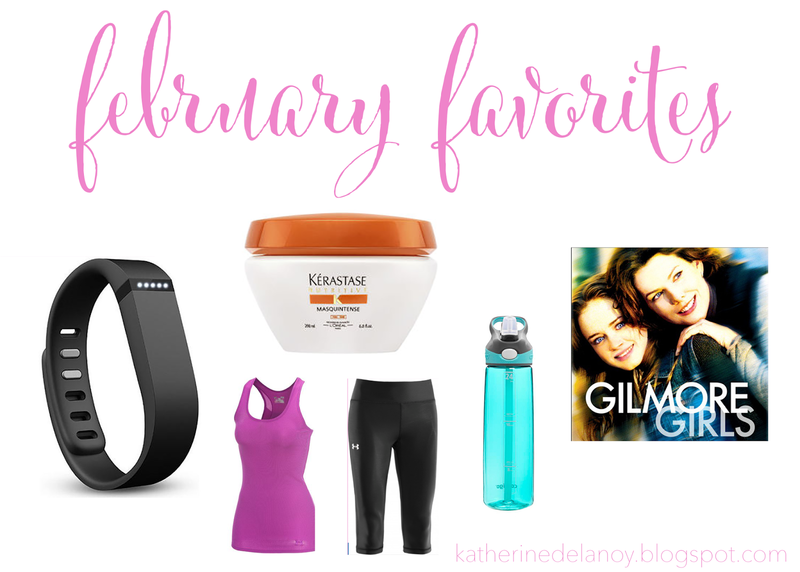 Linking up with Mia and Kelli to share my favorites from February! FitBit// Loving it! Keeps me moving! If you have a fitbit, let's be friends! Leave your email in the comments and I will add you! Kerastase Masquintense fine// My fabulous hair dresser recommended this masque to me in order to keep my from damaging my hair even more from the color! Win!! Since using the masque, my hair has been so soft!! Workout clothes + water bottle // No secret that I love workout clothes + double win if they keep you motivated to exercise! These pants and tank from Under Armour are my go-to right now! Some of you loved my water bottle I posted a few weeks ago, so you can find it here (similar)! Gilmore Girls // Why I never watched Gilmore Girls when I was younger I'll never know! While I was recovering from the flu I decided to start the series on netflix. hooked. I keep hearing great things about the Kerastase products, I need to try! Can't wait to try that masque! Kate! I didn't recognize that this was your blog at first because I forgot about the name change! I'm loving it! Love the new blog look! :) Work out clothes encourage me to work out too :-p I need more...maybe it'll make me workout more! Thanks for linking up! Sorry for the delayed comment!